I’m still trying my best to cook at home at least 5 times a week, mostly avoiding the pitfalls in my cooking at home flowchart. We make pizza at least once every other week, as it tastes better than anything from the frozen aisle and is very flexible. We’ve recently topped one with leftover corned beef from St. Patrick’s Day. 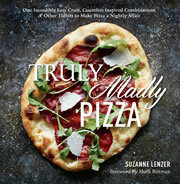 Suzanne Lenzer of the New York Times recently shared her own pizza dough recipe in Homemade Pizza, Easier and Faster. So let’s assume you already know that homemade pizza is better and quicker and cheaper than what you can buy at the neighborhood pizza place. You know the reasons to make your own, which are as obvious as they are appealing: You can top a pizza with virtually anything (from special ingredients to leftovers) or almost nothing (one of my favorites is little more than a smear of caramelized leeks dotted with taleggio). You can bake it in minutes — it takes longer to heat up the oven than to bake a pie. No kneading! Use a food processor instead. Pizza dough by hand isn’t hard, but this makes it stupid easy. Dump stuff in food processor and turn on for 2 minutes. Done. Takes 30 minutes all-in on the weekend. Yes, you’ll want to make it ahead for busy weeknights. 20 minutes includes the minimal prep, using the food processor, the rise, and cleaning everything up during the 20-minute rise. Clean counter to clean counter, 30 minutes. Make ahead, store in freezer. You keep it in the freezer until you need it. Throw it in the fridge to thaw in the morning. Take dough out and preheat oven when you get home. In under 20 minutes, food can be on the table! We used all-purpose flour. The recipe says bread flour and we’ve used it in the past, but AP flour worked just fine and it’s less hassle. We used a rolling pin to roll out the dough. The recipe says to stretch the dough by hand and specifically says “not flat on a work surface”, but we use a floured, flat surface and a rolling pin. It still works and takes nearly zero skill! Here’s a good, simple YouTube video that describes the stupid-proof method. I like stupid-proof. Parchment paper for the win. We bought a baking stone. It got all nasty after a few months. Now we just use a half baking sheet that can preheat in the oven and parchment paper. Also stupid-proof, as it always results in no sticking! Although if you bake 550 degrees, the paper may turn black. We bake at slightly lower temps. Double the recipe. Assuming your food processor isn’t one of those tiny ones, I like the article’s tip to double the dough recipe. Now you’ll get four balls of dough in 30 minutes. Side tip: Don’t got half an hour on Sunday? You can also freeze pizza dough from the supermarket. You can buy a ball of pizza dough for $1 to $2 at places like Safeway or Trader Joe’s. If you look at the ingredients, many of them are quite simple with minimal questionable additives. Freeze it ’til you need it.